“Dear Universe, I know you have many troubles to address but can you please add the abolishment of the “Selfie” to your agenda...” – tweeted Karan Johar, usually not renowned for spilling profound gems of wisdom even when he is drunk. Being a popular film maker in Bollywood and a celebrity one in that, I can fathom where he is coming from. Like the other day, at the airport while waiting at the departure gate one suddenly saw a rush of people crowding around a person. I heard later that he was a popular small screen actor who also featured in couple of movies as one of the sidekicks. He sat down on the steps and was graciously acceding to requests from his fans for a “Selfie please” and soon a “Selfie pandemonium” ensued. Now if this is the scene for a relatively obscure TV star, one can imagine what would be the situation with Karan Johar and his many A-star friends!!! From the time, mobile phones with front cameras came into existence few years ago, the Selfie has become a global obsession. Ofcourse the word “Selfie” had not entered the day-today vocabulary until Oxford Dictionary officially recognised the power of this new vogue. But today I guess, a day seldom passes in the world for the young without posing for a Selfie. Every day web crawlers must be stumbling upon millions of Selfies of all types being uploaded by netizen all over the world. You just need to google “Bizarre Selfies” to see how this Selfie obsession has reached bizarre heights. Recently I saw somebody posting a Selfie from the temple Sabarimala with a caption “Selfie Saranam” 🙂 :). It won’t be too long before people posting Selfies after returning from funeral service with you can imagine what 😟. I am sure Singapore zoo would be contemplating to replace its signature “Breakfast with Orangutan” with “Selfie with Orangutan” to keep tourists more excited :). In all places of tourist interest across the globe, “Photo stops” will soon be replaced by “Selfie Pit Stops” where visitors can take their own pictures with the scenic spot in the background. Move over Group photos, “Groupselfies” are here!!! I say global obsession because the bug didn’t catch just the common you and me but even the celebrities. 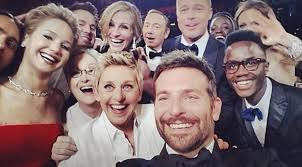 The number of times the “Oscar Selfie” got retweeted is a new question in Kaun Banega Crorepati. More than the Oscars, the Oscar Selfie got talked about this time!!! That it was a smart advertising plug for a newly launched Samsung smart phone was not known to the naive. Our own Narendra Modi is now a staple part of many Selfie anecdotes. 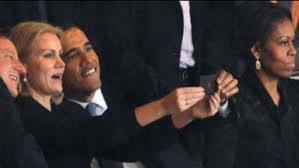 I am told that Obama is making this trip to India in Jan mainly to take a Selfie with our PM as he missed to take one when Modi was in the US 😃 😃. 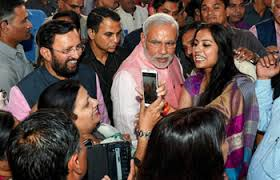 Modi’s Selfie after casting his vote during the elections stirred up a hornet’s nest for breaching propriety. And more recently his Diwali Milan event with the editors and press corps ended up being a “Selfie Milan” where top editors of the country were seen rubbing shoulders literally with the PM for a Selfie. In press conferences in the past we usually saw editors asking tough questions to leaders. However these days where journalistic calibre is measured by level of access rather than other skills, a reporter’s calling card is probably the volume of Selfies with many politicians in his resume. Talking of access and calling cards, all along it was only road side astrologers and soothsayers who use to flaunt pictures of them with celebrity actors, singers, politicians,… to build their credibility. Mostly these pictures would be taken without the knowledge of the celebrities, with the concerned gentleman just slipping himself in within the frame and later helped by some photoshopping. Now I guess it’s the Selfie routine which is used for marketing self. While to some extent the Selfie obsession when clicked with others is understandable what is not is the Selfie of just the self. I’m sure this “Selfie Syndrome” will find its way into the list of medical disorders soon (if not already). Invariably in a Selfie a normal person ends up looking scary with eyes popping out and also puffed up. Inspite of this, to keep clicking Selfies in Close-ups and posting in public domain certainly falls under Narcissistic personality disorder!!! And blame it on the social media to fuel this condition. 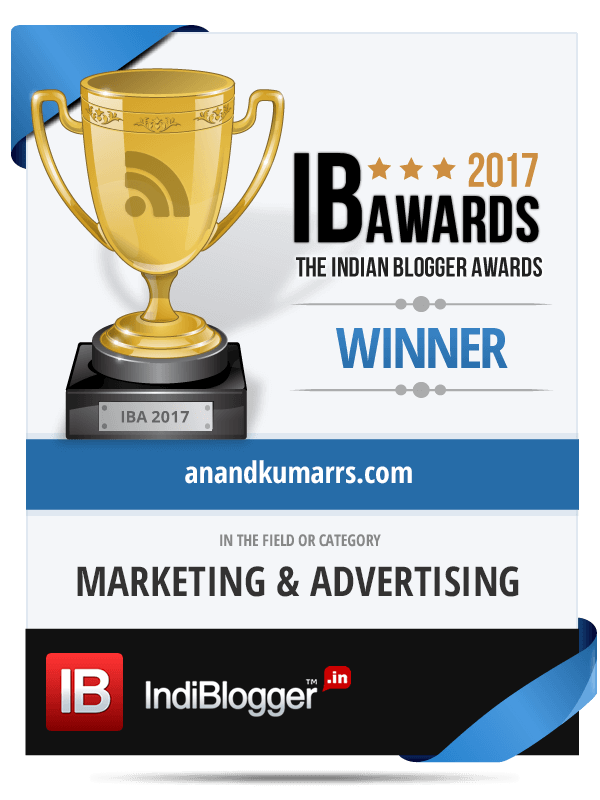 With the Selfie Syndrome or Obsession gaining ground rapidly, its’ only natural that marketers jump into the bandwagon and milk it. So we now have a “Selfie Stick” which can be attached to phones and cameras to click more photogenic Selfies from a distance and not necessarily from Arm’s length!!! And Selfie Sticks with Bluetooth!!! Timer Apps!!! So there you go – a slew of products around this latest fixation. And as I write this, there is more evidence springing everyday of the booming “Selfie Economy”!!! “Now get a Selfie in space for Rs 50000” – it seems!!! Read here. 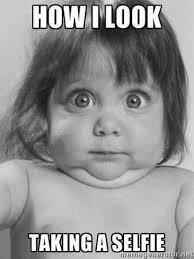 “The Selfie effect?? Cosmetic procedures rise manifold” !!! Read here. Sorry Mr. Johar, it looks like on this one, all the universe may not conspire to help you. So go with the flow.